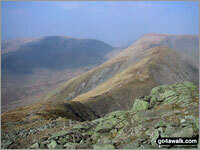 Trust the experts - these are the Lake District 'ridge' walks you really cannot afford to miss! One of the best things about walking in The Lake District National Park is the opportunity to walk along high mountain Ridges* with grand vistas on either side. In fact, after doing all that uphill work to reach a mountain summit - it would be a shame not to venture at least some way along the ridge before descending again to a well earned drink. But because there are so many great Ridges* in the Lake District to walk along - deciding which one is the best to do first (or next) can be daunting. We've been walking the Lake District Fells for more than 40 years and this list is a collection of 25 of our personal favourites. This list includes walks, routes and maps of various lengths, ascents, grades, airiness and popularity so there is bound to be something to suit you (and your energy levels). In any event, all these Lake District ridge walk route maps take you to the vantage points offering the very best views in the Lake District - so go on a nice day if you can.